A chance encounter with an enviornmentalist in a remote valley of B.C. 's Interior sparks a massive change in my life. Less than a year later, growing food has become a passion for me, one that I am anxious to share with everybody so that they too can reap the benefits aswell as participate in an environmentally beneficial activity. I had only a mild interest in gardening until one day while cycling up a Lillooet Valley back road I met Andy Miller from the Western Canada Wilderness Committee who directed me towards a tiny and remote town in British Columbia's interior. I arrived to the beautiful town of Seton Portage two weeks later. There was only a few houses scattered along the quiet valley floor. Rows of tall Ponderosa Pines, a couple of rustic motels, a general store and a pub comprised the main street. The town was cast among the shadows of the steeply forested and snowy Cayoosh Mountains and was ringed by the great Seton Lake on one side and the enormous and dramatic Anderson Lake on the other. I was there to check out the WWOOFing farm that Andy from the Wilderness Committe had recomended. I enjoyed the people and project so much that I stayed and for a couple of weeks. I weeded, I tilled, I transplanted, I and trenched canals for the stream fed irrigation system. The garden, was grown for the community. The food was to be distributed amongst the First Nations who lived there with the purpose of encouraging others to grow there own food as they had in the past and to promote a return to self suficiency and sustainable living. I found Planting and gardening to be immensely satisfying and the concept of a community or even just individuals becoming more self reliant and less dependent on imported foods appealed immensley to me. I strive to reduce my consumption and by gardening I do so in a way that is beneficial to my health, is economical, and is educational on a subject that is relative and interesting to anyone. I honestly dont know which aspect of appeals the most. For health, it is not only my diet that benefits, but also my mind and spirit as I watch the little plants grow from seed, transform into food and then feel much appreciation for their goodness and origin as I eat them. The economic benefit is hard to gauge because all though my back yard yield is not enormous, the quality of it is superb; the fresh greens sweet cherry tomatoes and abundant basil are far beyond what is available in most stores or restaraunts. The education must be the best part though. To see and understand how your food is created after having eaten it your whole life brings curiosity and a further understanding of how humans fit into nature. I was entertained to watch beans vines grow and climb there way 20ft over the summer, I was surprised that oregano and most herbs can become tremendous weeds, and I was perplexed as I watched tomatoes grow from the tiny little flowers on the tomato plant. I am fascinated by how beans and other legumes as a team with bacteria that live on their roots are able to pull Nitrogen out of the atmosphere and fix it to the soil, thereby enriching it. Similarly I find it interesting that if crops are rotated appropriately and some plants companioned with others, pests can be minimized and the likelihood of molds and diseases are reduced. I read on about the benefits of manure and compost increasing water retention, building the soil with organic matter and nutrients, and then compared the cheap abundance of it in relation to the cost of fertilizer. Furthermore, I saw the inefficiency of spending so much energy and effort to mine, produce and transport it from factories far away.to my house. I am committed to sustainable gardening. My goal is not to farm organicaly but every effort I make towards sustainable harvest seems to go along with the organic style. When I returned to Vancouver from Seton Portage I focused on my own yard, which my dad has successfully been growing a patch of chard, beets, and a wild mix of greens and lettuces for years. First, I fixed the rotting fence lining our yard. I did so by buying just 10 pieces of wood and reusing the present boards by chopping their rotten bottom sections off and staining them deeply to last many more years. Then I cleared a section of our front yard bamboo forest to hang hammocks allowing me to relax comfortably in the cool shade during the exceptionally hot days of that summer. Next, I bought another five tomato plant seedlings of different varieties like Sun Gold and Gold Nugget and planted them along the three my dad already had going. I built a box out of scrap wood that was cluttering my yard and in it I planted a potato plant. As it grew I added soil and heightened the box with the extra rings I had made. I had read that 100lbs of potatoes could be grown from such a potato box where soil is continuously added. I was unsuccessful in terms of such a massive yield but did get about 25 delicous potatoes and the satisfaction of watching the potato vine grow over 5 ft and then flower beautifully was worth the while. This Spring I will try again and instead of buying a potato plant for $7 I will just plant the potatoes that start chitting in our cupboard before we eat them. I maximized our existing garden space and added rows of bush beans to further enrich our soil, which by the way is exceptionally sweet in part thanks to the 6 yards of manure my dad ordered in the spring. Then I built trellises of branches from tree trimmings along both fences of the backyard and planted runner bean vines that would yield large amounts of green beans well into November. By August the tomatoes were ripening and easily picked as they grew on the porch next to where I sat and ate lunch. The summer squash plant bushed out madly and oddly shaped squashes were beggining to ripen soon to be picked, baked in olive oil, sea salt and fresh garden rosemary. I made pizzas out of sweet orange cherry tomatoes, basil, wild arugula, fresh oregano, and home made garden pesto. Rainbow chard and many fresh herbs were picked daily while I washed down the delicious food with mint infused gin and tonics, mojitos, and Moroccan tea. Peaceful reggea music eased from the radio while the bean vines and squash leaves danced in the breeze. Good vibes spread throughout the jungle garden. My calico cat Luca was always jumping through the trees and sprinting back and forth between the rows of veggies. This was the good life and all the rewards and delicousness convinced me that I had to grow more and despite the maximized space I had to further the production. I decided to build a greenhouse. Not only would a greenhouse put to use the large concrete pad that sits awkwardly at out yards north east corner, but also it would extend our growing season considerably by allowing an early start for seedlings, and a late harvest in the winter. Furthermore, it would allow me to grow some exotic plants like yams, habanero peppers and perhaps even avocados or limes. I was about to order some glass that I found for a great deal on craigslist until my dad questioned if my design was efficient. "Sure I put the glass in a framed box and it warms up inside," I said, thinking the project would take a few hours to complete. He explained his concept of how a greenhouse would work efficiently in a cool northern climate. I didn't agree exactly with his idea but I did understand that old school Victorian style greenhouses are overly simplified and not neccessarily optimized for heat efficiency. My friend Justin had similar ideas as my dad and by drawing some diagrams and ellaborating I began to understand how and why such a design would be more efficient in this northern climate. The key aspects of this modern design are firstly, considering that at 49 degrees latitude the sun is always quite far in the southern sky much of the glass should be angled to the south and allow maximum solar transmission into the greenhouse, secondly, other walls where little or no direct light enters should be insulated and stacked with heat sinks such as bricks that absorb eat during the day and then radiate it back to the plants overnight. I hit the drawing board and I hit it hard. I used some geography skills I learned from a weather and climatology course I had taken and analyzed where the sun was at which time of year. Because the solar declination at the equinoxes was 40 degrees I figured the perfect slope would be roughly perpendicular to that. I measured the pad and figured optimally how wide and long the greenhouse would be to allow room for tending the beans around its sides, getting by and still leaving enough room for trashbins and compost barrels. Part of the challenge was making a design with which I could re-use the sheets of tempered glass from sliding glass doors of demolished buildings and renovations that were available for cheap from glass recyclers I found on the internet (tempered glass is 3 times stronger than regular glass and many times safer because when it breaks the whole sheet shatters into small cubes rather than heavy shards). Ideally my greenhouse would be built entirely out of recyled products but in the end I was not able to find so much used lumber in time so I had to order quite a bit. My greenhouse was going to be 15 feet long, 10 ft wide, and 10.5 feet high. Just in time as I decided to put the plan into action I found another person on craigslist selling the same type of recycled glass for even cheaper. I went and met him on 12th and Commercial on Vancouver's east side and he took me to his garage where he stashes his junk and where he lives in his truck. He was from Newfoundland, his passion was recycling and we got along very well. It turned out that he only had eight pieces but he assured me he could get as much as I wanted as he was very well connected with other recyclers and junk collectors. The next morning he phoned me and said" yes b'y! I got yer glass!" When he arrived I saw that the glass was of a variety of sizes of 76"x34, 76"x44, and 74"x 31 3/4", wtf? But because of this he gave me some for free so all 20 sheets of tempered glass and a bonus door with delivery cost me $300. Not much more than a sheet of tempered glass purchased new! I went straight back to the drawing board to accomodate the variety of sizes but quickly figured out that I could make it work and then bursting with excitement I rode my bike to the lumber yard and hand picked a bunch of fine pieces of wood for construction. Knowing that there was a slight chance that my parents might be selling our house or otherwise possibly be wanting to build a lane way cottage I decided to build the house in a pre-fabricated style where pieces were cut, individually painted, and screwed together for easy dissasembly if required. This process of pre-fabed pieces was quite challenging to plan around but I made swift progress and especially so with my friend Anna from Tennesse helping me paint them. Unfortunatly though, we had to leave the project after just a few days. Anna and I were going on a two week wilderness trail building trip into the deep and remote Clayoquot Valley (which was amazing but is another story entirely). For the rest of August I was travelling through different wildernesses and sometimes the urge to be back in my wonderful garden at work on my project was tremendous or even painful. Finally I was finished travelling but was then back at school and suddenly I had many payed work opportunities on the weekends that I needed some cash. In October I began to pick up momentum, though I missed another full weekend to go on another Clayoquot trail building trip. Finally in late November things were taking shape and my vision was becoming a reality. The structure was framed up and the glass was being installed. I found a nearby source of nearly 1000 free bricks for heat sinks on the north wall, I found large amounts of free scrap glass and aluminum windows for cutting the sharp angled pieces. I got some old gutters from my boss, I found a massive amount of exuisite Douglas Fir 2x4s in a trash bin outside a glass shop which I proudly salvaged and am using to construct tables and other fine things. Hopefully I will use them to built another greenhouse, one that will be to sell. I know its ironic that I would be so proud of pulling junk out of a dumpster but really its one of the best things Ive ever done. The more I looked for materials the more I found. Riding my bike through alleys I found that many other peoples' junk was absolutly useful to me. My next door neighbour hired a man to clean his whole yard into a trash bin so I asked if I could take some stuff. From him I ended up with enough cedar boards from the fence he ripped out to dress the south wall of the greenhouse, I got a huge piece of glass, a composting bin (full of 100% composted compost), some cedar and fir beams, and enough fir 2x6s to make a flower bed around the greenhouse. I used a stash of leftover cedar siding that has been collecting dust for six years at my house and ripped them into beautiful strips to secure the glass and protect the structure from weather. I saved myself thousands of dollars on materials, reduced the total consumption of resources greatly and ended up with a bunch of quality products such as douglas fir that are all but endangered and impossible to obtain without spending big money. I feel that I could not have done a better job even if I tripled my budget and bought new products. Obtaining free materials takes time and energy too but not enough to offset the savings. To be honest, I was surprised that everything came together so well. All my predetermined measurements were perfect and the angles locked together tightly. The biggest challenge was definetly cutting the glass. I had never cut glass before, but I had watched my old boss Cyril cut glass so I had an idea. Unfortunatly though, he was not usually successful and his attempts often ended in great frustration and explosions of shattered glass. I borrowed his glass cutter, which is smaller than a pen and runs a tiny cicular blade that scribes the glass. The cutter can then apply firm pressure and break the glass into two clean pieces. Im afraid I had only a little more luck than Cyril but with lots of free glass to work with, tough gloves and proper eyeware to protect my eyes from flying shards I eventually managed to get all the crazy sharp and awkward angles cut. One of the final touches was running the gutter down pipes into the greenhouse where the water from the roof would fill up two huge 25 gallon containers. The water containers were reused food containers. To be specific they originally had contained 25 gallons of artificial vanilla flavouring, which I think is pretty disgusting but I washed their insides out thoroughly with soap. The water barrels not only supplied me with easily accessable water for inside the greenhouse that is free of chlorine and other nasty things we find in our city water supply but they are also effective heat sinks. Water has an extremely high specific heat, which means that if it heats up during the day it will slowly cool down over night. As it turned out my rainwater collection system would prove sufficient enough to supply all the water for my glassed in jungle throughout most of the summer when water shortages often hit Vancouver and watering is restricted. 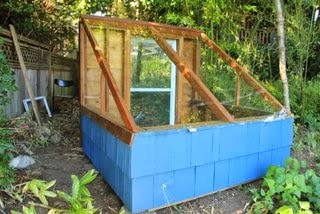 Unfortunalty, by the time the greenhouse was finished it was winter and I could not plant anything in it. I did, however, start spending a lot of time just hanging out in it. It made a great place to have my buddies over for beers as well as for studying. With candls and a heater going it has a very nice and peaceful ambience and especially so when storms are raging on around it. It was sad to not grow anything for a while so I pondered what other opportunity to grow food there might be. I decided that my yard farm, though substantial, was not enough and that it would be worthwhile for me to expand and even exponentialize my passion for gardening. Encouraging others to grow their own food would improve their lives directly by economic, health and educational means as well as the lives of others by reducing all the externalities of commercial food production. I sent a letter to the president of my school proclaiming the potential benefits of a garden for all parties around the school and community. The President was interested enough to meet with me and in the end I have so far met with the Vice-President who expressed approval for the idea. I have the Langara Environmental Issue Committee and the Langara Student Union on board and eager to support the project. We have a few annoying restrictions but will now work on putting together a plan for approval. Hopefully the school will soon have a garden and it will be available for students to learn from, grow their own food in and ideally to serve as a focal point for environmental and sustainable thinking. Finnaly,its time to start bringing life into the greenhouse. It is mid February and I am confident that it is the time to start planting. Vancouver experienced its warmest January in history (kind of worrisome really how warm it was) this year and so I am seizing the opportunity to get an early start. Me and my dad have ordered an incredible mix of seeds from West Coast Seeds. I recommend ordering from them for inexperienced growers because they give great tips, instructions, and techniques. Anybody could go to there website or any right now, browse the catalog and order seeds immediatly. Its very easy, there is no excuse not to try gardening! My greenhouse soil is a simple mixture of 3 parts compost(the nutrients and food), 3 parts peat moss(the medium and water holding capacity), and about 1 part perlite (porous and helps hold oxygen and assist draining). I have found plenty of free containers by cruising back lanes on my bike. That is the kind of thing that would be silly to buy when its certain that there are many heading to the landfills. For the early spring my plan is to grow Kale and other greens, some beans, brocolli, radichio, leeks, spinach, beets and chard. Soon though, I will get the potatoes started, and in not too long the tomatoes, basil, hot peppers, yams, carrots, cucumbers, squash, epazote and eggplant. Outside many perennial are already up such as the wild arugula, chives, mint, oregano and my bed of garlic that I planted in December is already looking very healthy and delicous. I really cannot explain the joys that I get from gardening. To raise the plants from seeds is to celebrate life. To give opportunity for one seed to quickly grow into a beautiful vine or bush that produces a thousand more seeds, a harvest of food and a habitat for birds and insects is satisfying in itself. The additional benefit is the healthy and delicious food, the saying hello to your neighbor over the fence, the hours spent outside on beautiful afternoons and the thought that surely this is more sustainable then the energy intensive and unethical factory style of food production that one would otherwise support. I urge people to give it a a shot. start small, start with your favourite vegetable or buy planting a seed you find in your food or a potato plant that is chitting in your cupboard. Plenty of information is at your finger tips via the web and even a patio or window could be a potential garden spot. All around us in Vancouver is potential garden locations and I am certain that soon in the near future we will increasinly see gardens replacing lawns, covering roof tops and becoming a cornerstone of strong and vibrant communities. If you are interested then start a compost or buy some manure. Cut up your lawn with a spade shovel or rototiller and throw that healthy manure or compost in! Plant some delicous greens like arugula, which are dead simple and gourmet or anything you wish. If you are already a gardner, then please spread the good vibes. Do your friends a favour and get them started. You do not have to be as determined as me but just remember that planting a single seed can grow a bush that produces hundreds or thousands more; any one of those seeds could carry the cycle on until a magnificent garden has grown!